Purpose Paxillin regulates cell-cell adhesion, and altered Paxillin expression has been associated with human carcinogenesis. This study analyzed the association between Paxillin expression in prostate cancer (PCa) tissues with clinicopathological features, lymph node metastasis and biochemical PCa recurrence. Methods A total of 386 tissue specimens from PCa patients who received radical prostatectomy and 60 tissue specimens from benign prostatic hyperplasia (BPH) cases were collected to construct tissue microarrays, which were subsequently immunostained for Paxillin expression. Thirty positive lymph node tissue specimens and 10 healthy prostate tissue specimens were randomly selected for Paxillin immunostaining. Results The association between Paxillin expression, lymph node metastasis and biochemical PCa recurrence was analyzed. 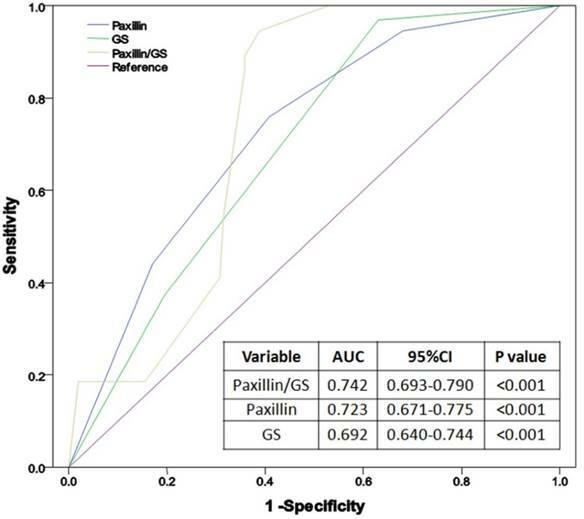 Paxillin expression was significantly higher in PCa than both normal and BPH tissues (P<0.001) and was correlated with preoperative prostate-specific antigen level, Gleason score, clinical tumor stage, lymph node metastasis, positive surgical margin, extracapsular extension and seminal vesicle invasion (P<0.05 for all). Logistic regression analysis showed that Paxillin and Gleason score were independent risk factors for PCa lymph node metastasis (P<0.05). The receiver operating characteristic (ROC) curve indicated that Paxillin expression (AUC=0.723) more accurately predicted PCa lymph node metastasis than Gleason score (AUC=0.692). Kaplan-Meier curve analysis showed that increased Paxillin expression was associated with shortened biochemical-free survival (BFS) after radical prostatectomy (P<0.001). Conclusion Paxillin was significantly upregulated in PCa compared with BPH and normal tissues and associated with lymph node metastasis and shortened BFS of PCa. Further study will investigate the underlying molecular mechanism and the role of Paxillin in PCa. Thus, this study sought to detect Paxillin expression in PCa versus normal and benign prostatic hyperplasia (BPH) tissue specimens and associate Paxillin expression with clinicopathological characteristics, lymph node metastasis and biochemical recurrence in PCa patients. The study was approved by the Medical Ethics Committee of the First Affiliated Hospital of Fujian Medical University (reference number: 2013085). All patients provided written informed consent. We collected 386 tissue specimens from PCa patients between January 2008 and January 2013 from the First Affiliated Hospital of Fujian Medical University. The patients were diagnosed with PCa according to EAU guidelines and underwent radical prostatectomy plus PLND without any preoperative adjuvant endocrine therapy or radiotherapy (335 patients received standard PLND with a resection range including obturator formamen and external iliac vein peripheral lymph nodes, while 51 patients received extended PLND with peripheral lymph node fat tissue having an upper bound to the common iliac artery bifurcation, a lower bound to the femoral canal, both sides to the pelvic wall and a back bound to the obturator nerves, blood vessels and anterior internal vein). We also collected 60 random BPH tissue specimens and 10 cases of healthy prostate tissue specimens from our hospital as controls. Among the samples, 30 positive lymph node cases were randomly selected for Paxillin immunohistochemical staining. Clinical data, including age, prostate-specific antigen (PSA), prostate volume, PSA density (PSAD), body mass index (BMI), clinical tumor (cT) stage, numbers of lymph node metastasis, positive surgical margin, extracapsular extension and seminal vesicle invasion were collected (Table 1). Sections were de-waxed, rehydrated, and then antigen retrieval was performed using 0.1 M citric acid buffer (pH 5.0; Fuzhou Maixin Biotech. Co., Ltd., Fuzhou, China) in a high-pressure cooker. Following antigen retrieval, tissue microarrays were incubated with 3% H2O2 for 10 min to block endogenous peroxidase activity and subsequently with 20% normal goat serum at room temperature for 30 min. Next, the tissue microarray sections were incubated with a rabbit monoclonal anti-Paxillin antibody (Abcam, Cambridge, UK) at a dilution of 1:800 at 4°C overnight. The following day, the sections were briefly washed with phosphate buffered saline (PBS) three times and further incubated with secondary antibody (DAKO, Santa Clara, CA, USA) at 37°C for 30 min and subsequently with ChemMate™ EnVision™ Detection Kit (DAKO). The sections were subjected to color reaction with 3,3´-diaminobenzidine (DAB) solution, briefly counterstained with hematoxylin and mounted with a coverslip. Confirmed positive sections were used as positive controls, and PBS in place of primary antibody was used as a negative control. The immunostained tissue microarray sections were reviewed and scored under a light microscope (Olympus, Tokyo, Japan) by two blinded pathologists. Any discrepancies were resolved by re-reviewing the sections. Two semi-quantitative methods were conducted, and the total Paxillin immunostaining score included staining intensity and the proportion of positive cells. Staining intensity (I) was recorded as 0, absent; 1, weak; 2, moderate; 3, strong, while the proportion (P) of positive cells was recorded as 0, <5%); 1, 5%-25%; 2, 26%-50%; 3, 51%-75% and 4, >75%. A score for each histological grade (H-score) was determined as: H-score = Ʃ (I × P), as described previously. [18, 19] The final Paxillin expression score (E-score) was calculated using the value of the percentage positivity score multiplied by the staining intensity score, which ranged from 0 to 9. Paxillin expression level was defined as "-" (scores 0-1), "+" (scores 2-3), "++" (scores 4-5) and "+++" (scores ≥6). SPSS 19.0 statistical software (SPSS Inc., Chicago, IL, USA) was used for all statistical analyses. Quantitative data were compared using independent samples t test, Mann-Whitney U test, Kruskal-Wallis test or ANOVA. Qualitative data were compared using independent sample chi-square test or Fisher exact test. Factors influencing lymph node metastasis predictors were analyzed using Logistic regression analysis. Receiver operating characteristic (ROC) curve was used to evaluate the predictive value of each indicator for PCa lymph node metastasis. Kaplan-Meier plots and the log-rank test were performed to assess the association of Paxillin expression with biochemical recurrence-free survival (BFS). P<0.05 was considered statistically significant. Clinical data of PCa and BPH patients were collected. The two groups were comparable with respect to age, BMI and prostate volume while PCa patients had significantly higher PSA level (Table 1). Immunohistochemical data showed that Paxillin protein was mainly expressed in the cytoplasm of positive cells, and Paxillin expression was significantly higher in PCa than normal and BPH tissues (Figure 1, Table 1). Normal prostate tissues were collected from patients aged 18 to 40 years who underwent radical cystectomy. Patients with prostatitis, BPH or PCa were excluded. Compared with Grade Group 1, paxillin expression was enhanced in Grade Group 2 and Grade Group 3 (P<0.05). Compared with Grade Group 3, paxillin expression was enhanced in Grade Group 4 and Grade Group 5; however, there was no significant difference between paxillin expression in Grade Groups 3 and 2. There also was no significant difference between Grade Groups 4 and 5 with respect to the paxillin expression. Paxillin expression was also significantly higher in LN(+) PCa (Paxillin staining in primary prostate tissues from patients with lymph nodes metastasis) than in LN(-) PCa (Paxillin staining in primary prostate tissues from patients who did not show lymph node metastasis). Paxillin expression was also significantly higher in paired positive LN tissue than in paired PCa tissue (P<0.05 for all; Table 2 and Figure 2). However, there was no significant difference of Paxillin expression between normal and BPH tissue specimens (P>0.05) Table 2. 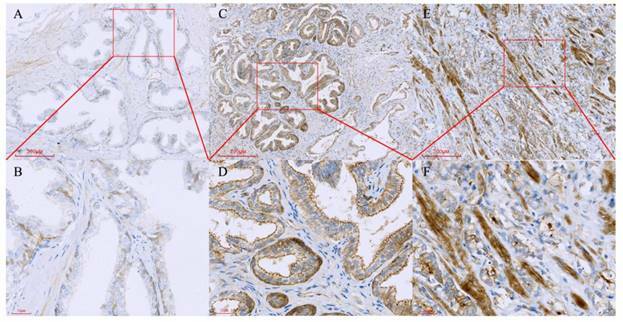 Tissue microarray containing normal prostate, benign prostate hyperplasia and prostate cancer tissues were immunostained with a monoclonal anti-Paxillin antibody. (A, B) Normal prostate, B is a high magnification of A; (C, D) BPH, D is a high magnification of C; (E, F) Prostate cancer, F is a high magnification of E.
Different Paxillin protein expression levels in prostate cancer tissues. (A) Gleason pattern 2: + (1×1=1); (B) Gleason pattern 3: ++ (2×2=4); (C) Gleason pattern 5: +++ (3×3=9). Next, 30 cases of paired positive lymph node tissue specimens and paired PCa tissue specimens were randomly selected for Paxillin immunohistochemical staining. The data showed that Paxillin expression was significantly higher in paired positive lymph node tissue than paired PCa tissue specimens (Table 2). Notes: The definition of H-score was defined as a score for each histological grade and was determined as: H-score = Ʃ (I × P), as described previously. Staining intensity (I) was recorded as 0, absent; 1, weak; 2, moderate; 3, strong, while the proportion of positive cells (P) was recorded as 0, <5%; 1, 5%-25%; 2, 26%-50%; 3, 51%-75% and 4, >75%[18, 19]. a Compared with normal prostate, P=0.890. b Compared with normal prostate, P=0.008. c Compared with Grade 1, P<0.001. d Compared with Grade Group1, P<0.001. e Compared with Grade Group 2, P=0.925, f compared with Grade Group 3, P=0.039. g Compared with Grade Group 3, P=0.032. h Compared with Grade Group 4, P=0.723. i Compared with LN(-) PCa, P=0.034. j Compared with Paired PCa Tissue, P=0.045. # Paxillin staining in primary prostate tissues from patients who did not show lymph node metastases. * Paxillin staining in primary prostate tissues from patients who had lymph node metastases. +The historical definition was applied to the New Grading System. We then looked for associations between Paxillin protein expression and clinicopathological data of PCa patients. Higher Paxillin expression was associated with higher PSA levels, Gleason score, clinical tumor stage, lymph node metastasis, positive surgical margin, extracapsular extension and seminal vesicle invasion (P<0.05; Table 3), whereas Paxillin expression was not associated with patient age (P> 0.05; Table 3). Paxillin expression was more commonly observed in Gleason score >7 PCa tissue specimens. Association of Paxillin Expression with Clinicopathological Features of Prostate Cancer. We then performed subgroup analysis to associate clinicopathological factors and Paxillin expression with pelvic lymph node metastasis in PCa. The results showed that PCa metastasis to pelvic lymph nodes was associated with Paxillin expression, higher PSA level, Gleason score, clinical tumor stage, positive surgery margin, extracapsular extension and seminal vesicle invasion (all P<0.05; Table 4), but not with age, patient BMI, prostate volume, PSAD or the percentage of positive prostate needle biopsies (Table 4). Multivariate logistic regression analysis showed that Gleason score and Paxillin expression were independent risk factors for PCa lymph node metastasis (P< 0.001, Table 5). ROC curve analysis showed that the area under the curve (AUC) of Paxillin expression (AUC=0.723) was much higher than Gleason score (AUC=0.692), while their combination could further enhance the accuracy in predicting PCa lymph node metastasis (AUC=0.742, Figure 3). Association of Clinicopathological Features with Lymph Node Metastasis of Prostate Cancer. Multivariable Analysis of Clinicopathological Features for Association with Lymph Node Metastasis of Prostate Cancer. Receiver operating characteristic (ROC) curves of Paxillin, Gleason score and their combination in the diagnosis of prostate cancer lymph node metastasis. Kaplan-Meier curve analyses of biochemical recurrence-free survival of prostate cancer patients stratified by (A) Paxillin expression, (B) tumor cT stage and (C) Gleason score. Univariate Cox proportional hazards analysis showed that higher pre-operative PSA level, higher Gleason score, advanced cT stage, extracapsular extension, seminal vesicle invasion, positive surgical margin and higher Paxillin expression were associated with PCa biochemical recurrence after radical prostatectomy. Multivariate Cox proportional hazards analysis further revealed that higher Gleason score, advanced cT stage and higher Paxillin expression were all independent predictors for PCa biochemical recurrence after radical prostatectomy (P<0.05; Table 6). Kaplan-Meier curve analysis showed that higher Paxillin expression, advanced cT stage and higher Gleason score were associated with shortened biochemical recurrence-free survival patients after radical prostatectomy (P<0.001 for all; Figure 4). Univariate and multivariate Cox proportional hazards analyses of prostate cancer biochemical recurrence-free survival. Prostate cancer is the most common malignancy in men and a major cause of cancer-associated death. In some moderate/high-risk cases, there is no disease progression for a long period of time, whereas lymph node and bone metastasis may occur in certain low-risk cases at early stages. [7, 22] To date, the application of PLND to all PCa patients remains controversial, and previous studies have suggested that PLND may only help clinicians accurately evaluate tumor staging and improve patient prognosis to a certain extent. [23, 24] However, other studies have concluded that PLND does not affect the prognosis of PCa patients with postoperatively confirmed pTxN0 stages, even if the patients had a relatively high PSA level, pathological grade, or capsule invasion before surgery. [25, 26] Moreover, PLND may also result in complications, such as deep vein thrombosis of the lower limbs, lymphedema and pelvic infection, in particular in patients treated with extensive PLND. Thus, some surgeons suggest that low-risk PCa does not require PLND and that standard or extended PLND should only be performed in moderate- and high-risk cases. [28, 29] In our study, 335 patients received standard PLND, with a resection range including obturator formamen and external iliac vein peripheral lymph nodes, while 51 patients received extended PLND with peripheral lymph node fat tissue having an upper bound to the common iliac artery bifurcation, a lower bound to the femoral canal, both sides to the pelvic wall and a back bound to the obturator nerves, blood vessels and anterior internal vein. Currently, there is a lack of a standardized protocol or specific tumor markers to evaluate or predict the risk of PCa metastasis to pelvic lymph nodes. Our study evaluated Paxillin expression in 386 PCa, 60 BPH and 10 normal prostate tissue specimens for associations between lymph node metastasis and other clinicopathological data. Paxillin was highly expressed in PCa tissues compared with BPH and normal prostate tissues. Paxillin expression was associated with higher PSA levels, Gleason score, tumor staging, lymph node metastasis, positive surgical margin, extracapsular extension and seminal vesicle invasion. We also found that Paxillin expression was significantly higher in LN(+) PCa than LN(-) PCa, which indicated that Paxillin may play an important role in PCa lymph node metastasis. Increased cell proliferation and motility could promote tumor growth and distant metastasis. Cell migration includes actin phosphorylation and cytoskeletal remodeling. [31, 32] Paxillin is a focal adhesion protein that mediates interactions between integrins and extracellular matrix and can also bind to a variety of cell-cell adhesion molecules, such as integrin and actin, to induce cytoskeleton remodeling; thus, increased Paxillin expression could result in increased cell adhesion and migration. Mackinnon et al. showed that Paxillin overexpression occurs during the earliest stages of lung cancer development, and that the most common Paxillin mutation (A127T) showed increased proliferation and invasive tumor growth, suggesting an important role for Paxillin in lung cancer development. In PCa, Paxillin expression promoted tumor cell migration and invasion in vitro and associated with PCa bone metastasis ex vivo. [13, 14] Our current data further confirmed these studies. The complete molecular mechanisms underlying Paxillin, a focal-adhesion-associated tyrosine-phosphorylated protein, activity have remained elusive. In 1998, Turner et al. demonstrated that Paxillin becomes tyrosine phosphorylated in response to multiple stimuli, including cell adhesion. However, it was shown that Low-molecular-weight protein tyrosine phosphatase (LMWPTP) overexpression, which correlates with earlier PCa recurrence and reduced patient survival, results in reduced Paxillin phosphorylation in PCa cells. Jackson et al. claimed that focal adhesion dynamics were influenced by the serine and tyrosine phosphorylation state of Paxillin; stating effects on motility and adherence were accompanied by increased serine and decreased tyrosine phosphorylation. In conclusion, the role of Paxillin phosphorylation and the role of total Paxillin protein levels both need to be further studied. Clinically, PCa mainly metastasizes to the pelvic lymph nodes, contributing to an unfavorable prognosis for PCa patients. Previous studies have shown that Paxillin expression was associated with lymph node metastasis in lung and colon cancer. [11, 38] In this study, we demonstrated that Paxillin expression and other clinicopathological factors, such as raised PSA level, Gleason score, tumor grade, positive surgery margin, extracapsular extension and seminal vesicle invasion, were associated with PCa metastasis to the pelvic lymph nodes. Thus, we speculate that PCa metastasis is a multi-factoral-induced phenomenon, and further studies are needed to elucidate the underlying molecular mechanisms that can be targeted to effectively control disease progression and provide a means to evaluate and predict PCa metastasis. This study had some limitations. For example, we could have analyzed the number of tumor-positive lymph nodes versus total numbers of lymph nodes in this study, which may have led to a more accurate determination of the association between Paxillin expression and lymph node metastasis. We did not carry this out, as the surgeons who performed PLND might not have had consistent techniques, leading to inconsistencies in the extent of lymph node dissection. Moreover, some patients received a standard PLND, while others received extended PLND. In addition, this study was retrospective and not well controlled. In conclusion, our data demonstrated that upregulated Paxillin expression was associated with PCa malignant behaviors, lymph node metastasis and shortened biochemical-free survival. This study was supported by Natural Science Foundation of Fujian Province, China (Grant No. 2015J01393 and 2017J01197) and the Funds for Creative Program of Health and Family Planning Commission of Fujian Province, China (Grant No. 2016-CX-27). All procedures performed in studies involving human participants were in accordance with the ethical standards of the First Affiliated Hospital of Fujian Medical University and with the 1964 Helsinki declaration and its later amendments or comparable ethical standards.